Secretary of State Rex Tillerson and President Trump are rarely on the same page. But nowhere is that divide more obvious than when the two talk about North Korea. This, of course, is welcome news to Americans who went to bed last night thinking about President Trump’s threats that North Korea will “be met with the fire and fury and frankly power, the likes of which this world has never seen before.” But it’s hard to take seriously when everything else the Trump regime does seems to make the situation worse. 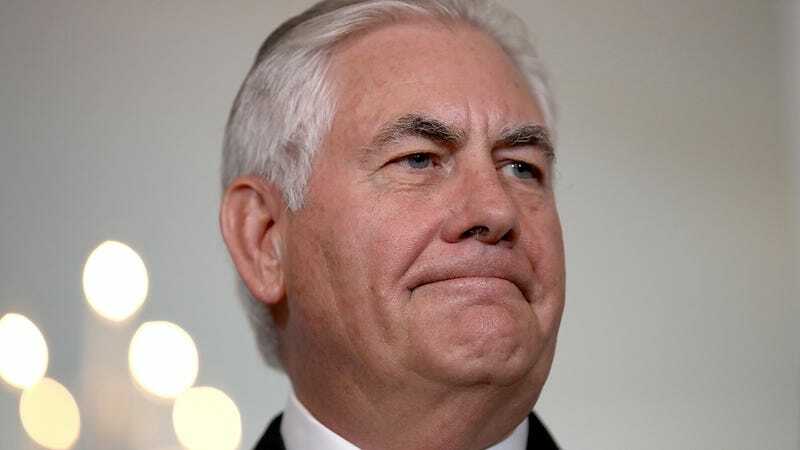 “I think what the president was doing was sending a strong message to North Korea in language that Kim Jong-un would understand, because he doesn’t seem to understand diplomatic language,” said Tillerson. “I think the president just wanted to be clear to the North Korean regime that the US has an unquestionable ability to defend itself, will defend itself and its allies and I think it was important that he deliver that message to avoid any miscalculation on their part,” Tillerson continued, defending the president. Tillerson and Trump have had vastly different responses to the rising tensions on the Korean peninsula. Tillerson has went so far as to recently insist that the US is not the enemy of North Korea. Trump’s most recent rant obviously undercuts that more diplomatic message. He’s also tweeted about America’s nukes. The Trump regime all needs to get on the same page, and quick. But if President Trump’s past of undercutting the more diplomatic members of his team is any indication, things are going to be messy for a very long time. Let’s just hope that this particular type of mess doesn’t include a full blown nuclear war. Because as Trump and Kim Jong-un each turn up the rhetoric, the world gets less and less safe with each passing day. Update, 10:40am: The State Department just released a transcript of the full discussion between the press and Secretary Tillerson. We’re not running out of pixels, so we’re publishing the entire interaction below. QUESTION: Mr. Secretary, President Trump said that North Korea’s threats against the United States, if they continue, will be met with fire and fury like the world has never seen before. Is this part of a diplomatic strategy or did you find those remarks to be unhelpful? SECRETARY TILLERSON: Well, I think the U.S. and international community with respect to North Korea has actually had a pretty good week. We had a unanimous UN Security Council resolution strengthening sanctions against North Korea with China and Russia joining us in that vote, and then at ASEAN, a lot of strong statements coming out of ASEAN, and I think also reinforced with a global community that has expressed its view that North Korea really needs to stand down this program. And so I think in response to that, North Korea’s rhetoric has just ratcheted up louder and louder and more threatening. So I think the President – what the President is doing is sending a strong message to North Korea in language that Kim Jong-un can understand, because he doesn’t seem to understand diplomatic language. I think the President just wanted to be clear to the North Korean regime on the U.S. unquestionable ability to defend itself, will defend itself and its allies, and I think it was important that he deliver that message to avoid any miscalculation on their part. QUESTION: Well, one of their – one of North Korea’s responses was to say it’s going to direct missiles on Guam. That’s exactly where you are headed right now. Would you consider re-routing? SECRETARY TILLERSON: Well, the North Korean missile capability can point in many directions, so Guam is not the only place that would be under threat. No, I never considered re-routing the trip back, and I do not believe that there is any imminent threat, in my own view. QUESTION: Do you think there’s a longer-term threat, specifically about Guam, against the region in general? SECRETARY TILLERSON: Well, I hope not. Again, what we’re hopeful is that this pressure campaign, which the entire world now has joined us in, and with the engagement of China and Russia, two of North Korea’s closest neighbors – that they can begin to persuade the regime that they needed to reconsider the current pathway they’re on and think about engaging in a dialogue about a different future. QUESTION: Have China and Russia been helpful at all to you in the last 24 hours? Have you spoken with your counterparts and have they helped in any way? SECRETARY TILLERSON: Well, I haven’t spoken to them since we left Manila, which was, I guess, about a day and a half ago. But we had direct discussions in Manila about the situation. I know that they were having talks as well with the representative from North Korea. I think that is evidence that they have very good, open channels of communication to be able to talk to the regime of North Korea, and we hope that they will be encouraging them to stand down their program and abide by the UN Security Council resolutions, which both China and Russia have voted for in the past. So I’m hopeful that they can use their influence – and I think they do have influence with the regime – to bring them to a point of dialogue, but with the right expectation of what that dialogue (inaudible). QUESTION: Has anything happened in the last 24 hours to lead you to believe that we are moving towards a military option perhaps more quickly than anticipated? SECRETARY TILLERSON: Nothing that I have seen and nothing that I know of would indicate that the situation has dramatically changed in the last 24 hours. QUESTION: Do you have any immediate diplomatic plans to de-escalate the situation that could have an impact within days instead of months or years? SECRETARY TILLERSON: Well, we have a very active, ongoing diplomatic effort, most of which is behind the scenes because that’s where diplomacy is most effective. We had very open conversations and our telephone lines remain open, certainly, to China and Russia as well as our allies, and I think publicly, we’ve been pretty clear in our statements directed at the North Koreans as to what we would like to see happen and make clear to them that we do not seek to be a threat to them, but we have to respond to the serious threats that they make towards us. QUESTION: There have been calls for you to launch a new diplomatic effort. Do you feel that a new strategy may be warranted? SECRETARY TILLERSON: I do not. I think the strategy we’re currently on is working. In fact, again, we have now garnered widespread international support, obviously, not just with the UN Security Council resolution, but globally, countries are speaking out and expressing the same view as to what North Korea should do, which is not be a threat to the stability of the region. I think, in fact, the pressure is starting to show. I think that’s why the rhetoric coming out of Pyongyang is beginning to become louder and more threatening. Whether we’ve got them backed into a corner or not is difficult to say, but diplomatically, you never like to have someone in a corner without a way for them to get out. QUESTION: And what is Pyongyang’s way out? SECRETARY TILLERSON: Talks. Talks with the right expectation of what those talks will be – will be about. QUESTION: Do you have any advice for Americans? Should they be worried? SECRETARY TILLERSON: I think Americans should sleep well at night, have no concerns about this particular rhetoric of the last few days. I think that the President, again, as commander-in-chief, I think he felt it necessary to issue a very strong statement directly to North Korea. But I think what the President was just reaffirming is the United States has the capability to fully defend itself with any attack, will defend our allies, and we will do so. So the American people should sleep well at night. QUESTION: All right. Thank you, sir.